A stone astronomical observatory in Gyeongju, South Korea, Cheomseongdae (Meaning: "Nearer the Stars Palace") is considered the earliest existing observatory in East Asia and possibly in the world. 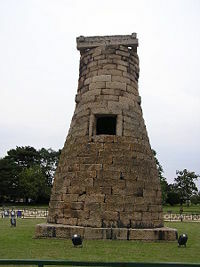 Constructed in 647 C.E., Cheomseongdae is considered to be the oldest existing observatory in East Asia. It is a familiar symbol on Korean coins and in travel literature, often symbolizing Korea itself. On December 20, 1962, the Korean government designated Cheomseongdae their 31st National treasures of South Korea. Koreans have had a fascination with the stars from their earliest history. They believe influences from the stars dictate the happenings in the universe, history, society, and the person's life. That view came from China, maintaining that the movement of the heavenly bodies determine the course of history and people's lives. The line between astronomy and astrology is sometimes blurred. Yet, undeniably, the Koreans' interest in the precise nature of the movement of the heavenly bodies for over 2000 years has led to a large body of astronomical knowledge. That Cheomseongdae has become a national symbol is fitting, since the observation tower represents both Korean's quest for scientific and philosophical knowledge. Cheomseongda stands 5.7 meters wide at the base and 9.4 meters tall. Cylindrical in shape, it resembles the upper part of a milk bottle. An opening is constructed half way up the structure. 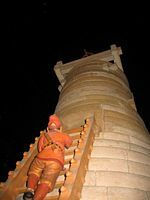 The astromomer is thought to have gained entry into the tower through the opening by climbing a ladder (see the image below). Today, dirt fills the tower to the opening level. Archeologists believe that the star gazer reached the top of the structer by way of another ladder inside. Resting on the top of the tower, eight rectangular stones (eight feet by six feet) are positioned to form two squares. Inside the tower from the opening, two sets of stone bars are positioned parallel to the top of the opening. Archeologists believe that those stones supported the stairway to the top. The tower is built out of 362 pieces of cut granite that possibly represent the 362 days of the lunar year. The window space is framed within three stone tiers making a total of twenty seven circular layers of stones. Silla engineers constructed Cheomseongdae in 647 C.E. to honor the reign of Queen Seondeok, the 27th ruler of Silla. Twelve of the layers are below the window level and twelve are above. Some argue that those twelve tiers represent the twelve signs of the Korean zodiac or the twelve months of the year. There are twelve large base stones set in a square, with three stones on each side, representing the twelve months of the year and four seasons. A scaled down model of the Cheomseongdae showing its use as an observatory. According to Samguk Yusa, Cheomseongdae was constructed upon the command of Queen Seondeok of Silla (r. 632-647) (선덕여왕) near the capital of the kingdom. Seondeok became the first queen to rule Silla after her father, King Jinpyeong of Silla (r. 579-632) (26th king), died without a son. The Queen Seondeok orded the Silla court to build Cheomseongdae, which they completed after her death in 647 C.E. From the top of Cheomseongdae, state astronomers observed the sky twenty four hours a day, 365 days a year. They recorded important celestial phenomena, dispatching a messenger to the royal throne to inform the monarch immediately. The king would convene the royal astronomical board to confer upon exceptionally significant events. The court would take into account the interpretations of celestial events when making recommendations before undertaking important projects, adventures, or ceremonies. Although Silla astronomers and the royal court gave heed to the signs of celestial events, however, they avoided becoming slaves of superstition. Before 535 C.E., Silla used a calendar borrowed from China but after that date Silla developed its own calendar. A Chinese envoy questioned the change, leading to Silla readopting the Chinese calendar. Silla dynasty astronomers accurately predicted solar and lunar eclipses and charted the course of comets. The kings and queens relied upon court astrologers’ readings for heavenly events to embark on wars, prohibitions, agricultural innovations, court and dynasty ceremonies, and every other significant dynastic activity. Some scholars have argued that the Cheomsongdae's design was heavily influenced by Buddhism, noting similarities between its design and Mount Sumeru, the center of the world according to Buddhist mythology. In the Silla dynasty, as in Korean culture today, the precise time of a baby's birth was used to describe that baby's future. The heavenly influences at that precise time were believed to set forever the baby's destiny. Tens of thousands of calculations were made by astrologers to determine the person's future events. Such astrological predictions were consulted when choosing a mate and parents prohibited the marriage of their children to persons of inauspicious astrological birthdays. The practice of making astronomical calculations for charting a person's alleged destiny can be traced back to recordings in Silla manuals and before. Though the observation tower Cheomseongdae does not mark the beginning of Korean astronomy and astrology, it respresents the enormous importance of reading the stars throughout Korea's history. The ancient Silla star watchers merited the title astronomer rather than merely astrologer, and the records of the Astronomer Royal and a Doctor of Astronomy in Silla are evidence of the high esteem in which astronomy was held in Silla. Nha, Il-seong. Silla's Cheomseongdae. Korea Journal. Vol. 41, No. 4, 2001. Rufus, W. Carl. Astronomy in Korea. Royal Asiatic Society. Vol. 26, 1936. Rufus, Will Carl. Korean astronomy. Seoul, Korea: The Literary Dept., Chosen Christian College, 1936. Song, Sang-Yong. "A brief history of the study of the Ch'ŏmsŏng-dae in Kyongju." Korea Journal. Vol. 23, No. 8, 1983. This page was last modified on 9 February 2017, at 19:30.